NORTH ROBINSON — A strong running attack gave the Colonel Crawford Eagles a 46-7 season opening win over the Mount Gilead Indians here Friday night. GROUND AND POUND: The Eagles amassed 270 yards of offense in the first half alone. Senior running back Trevor Shawber ran with authority for 173 yards on 11 carries and reached the end zone three times on runs of 41, 60 and 24 yards. FAST START: Fleet-footed Owin Seevers put the hosts up just seven seconds into the game when the 155-pound junior took the opening kickoff 85 yards down the left sideline. QUICK RESPONSE: Not to be outdone, Mount Gilead’s Timmy Brower raced 68 yards with the following kickoff to put the Indians at the CC 14-yard line. Senior quarterback Seth Young hit Jason Levings with a one-yard scoring strike. The extra point kick by Scott Page put the visitors up for the only time 7-6. GOOD POISE: Despite a heavy pass rush from a veteran Eagles squad, MG quarterback Seth Young showed good poise in the pocket and the ability to scramble. “He’s developed tremendously to our style of offense,” said first year coach Joe Ulrey. BY THE NUMBERS: Young completed 12 of 20 passes for 70 yards. He added 50 rushing yards on 13 trips. Junior Mason Mollohan, a 6-foot-5 junior, caught two balls for 19 yards and senior Robert Trapani grabbed three for 21 yards. QB Hayden Bute piloted Colonel Crawford with a fine performance, throwing for 115 yards and two scores, one a 71-yard pass to Seevers. MISTAKES MADE: Both coaches saw room for improvement after the game. Crawford coach Ryan Teglovic, despite his team’s performance, cited penalties (5 for 45 yards) and execution. “We got some thing to tighten up for sure,” he said. Mount Gilead had just three penalties for 20 yards. ACTIVE PLAYER: Senior defender Clint Erwin made numerous tackles for the Eagles, including back-to-back sacks of Young for -18 and -9 yards late in the first half. EXTRA POINTS: Senior back Hunter Trimmer pounded out 41 yards on 13 carries for the Indians. Neither team scored in the second half with a running clock in use due to the 30-point margin. Colonel Crawford honored its senior players, cheerleaders and band members prior to the game. NEXT: The Eagles visit Carey and Mount Gilead hosts Upper Sandusky. Mohawk and Wynford await in weeks three and four. “Upper Sandusky is a big school and will be a decent challenge. We just need to focus on us, and each guy doing his job and counting on your buddy next to you to do his job,” Ulrey said. 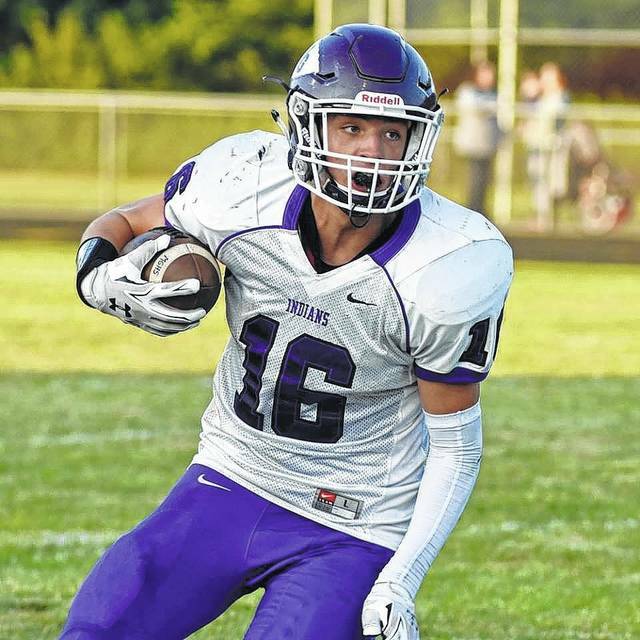 Mount Gilead receiver Mason Mollohan runs after catching a pass in the first half Friday night against Colonel Crawford. The Eagles won 46-7. Mollohan had two catches for 19 yards for the Indians. https://www.morrowcountysentinel.com/wp-content/uploads/sites/29/2017/08/web1_21106496_1449793361794351_7887456707856022242_n-4.jpgMount Gilead receiver Mason Mollohan runs after catching a pass in the first half Friday night against Colonel Crawford. The Eagles won 46-7. Mollohan had two catches for 19 yards for the Indians.